In our previous videos in this series we discussed anchor, image and environment tag helpers. In this video we will discuss Form Tag Helpers in ASP.NET Core that help us create forms. We also have Validation tag helpers. We will discuss form validation and model binding in our upcoming videos. By the end of this video, we want to create a form using the form tag helpers and style it using Bootstrap 4. 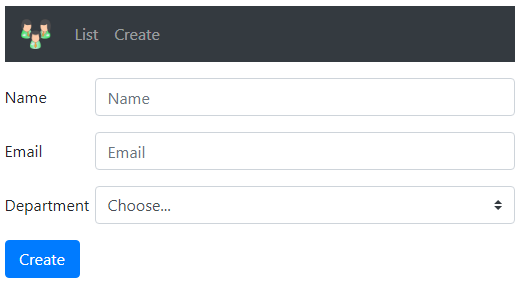 The "Create Employee Form" should be as shown below. The above code produces the following HTML when the form is rendered on the client browser. As you can see from the generated HTML when the form is submitted it will be posted to the index() action of the HomeController. Please note : By default, when a form is submitted, it will be posted to the same action of the controller that rendered the form. So this means, even if we did not specify the controller and action using the asp-controller and asp-action tag helpers, the form will still be posted to the index() action of the HomeController. The Input Tag Helper binds an HTML <input> element to a model expression in your razor view. In our case, we want a form to create a new employee. So the model for our Create.cshtml view is Employee class. We specify that using the model directive. To b able to capture the employee name we want a text box. We want the text box to bind to the Name property of the Employee model class. We do this by using asp-for tag helper and setting it's value to the Name property of the Employee model class. Notice we also have intellisense. Later if we change the property name form Name to FullName on the Employee class, and if we do not change the value assigned to the tag helper, we get a compiler error. The above code generates an input element with id and name attributes. Notice both of them are set to a value of Name. The name attribute is required and it is used to map the value of the input element to the corresponding property of the model class when the form is submitted. This is done by a process called model binding in ASP.NET Core. We will discuss model binding in our next video. The Label Tag Helper generates a label with for attribute. The for attribute links the label with it's associated input element. Consider the following example. The above code generates the following HTML. The label is linked to the input element, because both the label for attribute and the input element id attribute have the same value (Name). So this means when we click on the label, the corresponding input element receives the focus. Similarly, the following code generates a label and an input element to capture employee email. Generates select element and it's associated option elements. In our case we want a select element to display the list of departments. Ultimately we want a label and a select element with list of department options as shown below. The options for the department select element can be hard-coded like in the example above, or they can come from an enum or a database table. We do not have a database hooked up yet. So for our example, let's get the options from an enum. Department property data type is Dept enum. Notice, we are using asp-items tag helper and Html.GetEnumSelectList<Dept>() to get the options for the select element.